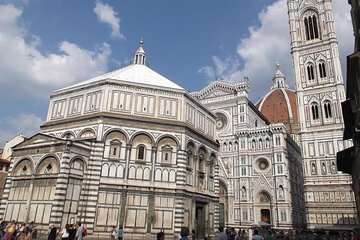 Dive into a particularly fascinating era of Florentine history with this 2-hour walking tour of Medieval Florence. Learn about the city of Dante during the 14th century. Meet your guide in Piazza del Duomo to explore the Medieval history of Florence. Make your way through the busy square, past the multi-colored Duomo and Baptistery and Giotto's bell tower. Walk through pedestrianized central Florence to the Piazza della Signoria, with the Palazzo Vecchio on one side. Arrive in what's known as the Dante District, where the great poet once lived. Learn about how writing for the nobility of the time was only done in Latin, and how Dante bucked tradition when he wrote 'The Divine Comedy' in the Tuscan dialect. This made it accessible to everyone. Visit the 14th-century Orsanmichele Church, which was originally built as a place to store and sell grain. Converted into a church in the late 14th and early 15th centuries, it became the chapel for Florence's powerful trade and craft guilds. Continue to Palazzo Davanzati, the final stop on the tour. This is the first architectural example of a Medieval house. It was built for a wealthy merchant family, and some of its original elements have been preserved – including some wonderful frescoes in the private rooms.